Most large companies have already made investments in tools that make video webcasting possible. Video is the most vibrant and intimate medium that executives can use to convey information to large, far-flung internal audiences. Video helps keep employees on the same page about company branding, strategic direction, and externally-facing stories and messaging. It facilitates the transparency and authenticity that today’s employees demand. CEOs of large, global corporations are frequently the catalyst for enterprise live streaming because they know they can use it to make a powerful and personal connection with tens of thousands of remote employees—efficiently and cost-effectively. They support using technology to foster communication and transparency, leading to a more engaged, productive workforce. They recognize the power of video. And they see how engaged, satisfied employees can collectively strengthen their company’s competitive advantage and enhance their bottom line. 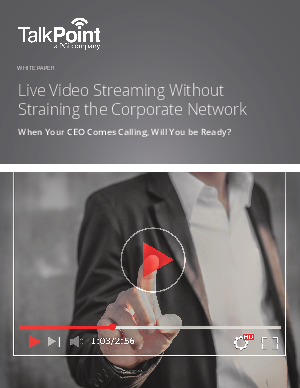 If your CEO or another executive hasn’t already asked to arrange live video streaming so he or she can deliver a message to all employees company-wide, it’s just a matter of time before they do. The request will come. Will you be ready?